It's not funny people. Stop giving people that deny Science a platform to deny Science to a larger audience. Teachers have it hard enough getting students to understand what is fact and what is fiction. Pretending like the people that believe that the Earth is flat have the same factual basis for their arguments as actual scientists is nonsense. Denying Science can lead to very harmful and dark times. History has played this out for us already. Whether it is Climate Change or a flat Earth, we need to stop pretending that a different opinion is the same as evidence that has been around for millennia in some cases. Science is based on questions. To get started with any type of Science, there is a question. Throughout history we have discovered the answer to many different questions. One being that the Earth is not flat. Stop pretending this is a debatable topic and focus attention on things that matter. The awesome people at Modular Robotics asked if I would take a look at their Cubelets 12 Kit and share some thoughts. To be honest, I was not sure what to expect when I opened the box and saw these Cubelets that snapped together using magnets. Like always, I tossed aside the directions and just start connecting cubes. Within seconds, I had the cubes with wheels sprinting off the table with the light cube on the front and a light sensor on top. I had accidentally created a light powered train! I had a huge smile across my face. Inverse Cubelet - Directs the flow in the opposite direction. Passive Cubelet - Lets data and power pass through it. Blocker Cubelet - Passes on power, but blocks communication between blocks. Rotate Cubelet - One face of the cube spins at the relative rate of power it receives. 2 Distance Cubelet - Infrared light sensor that detects how close or far an object is away. 2 Drive Cubelets - Cubelets with wheels. Battery Cubelet - Chargeable Cubelet that powers everything connected to it. Bluetooth Cubelet - Control your Cubelets from your phone by connecting via Bluetooth and the Cubelet app. What is nice about these Cubelets is that they can be connected in any order. The build options are limitless with the cubes. There also two connectors that allow for the addition of LEGOs. I like this feature because you can connect your LEGO creations to your Cubelets and use the Bluetooth Cubelet to control your LEGO creations. I love any tools that can allow connections to other tools. Modular devices are very nice and allow for many different creations for students. I can see students building their own robots with the Cubelets serving as the power, sensors, and wheels. Add some arts and crafts and your personal little robot could be connected to your phone through the Cubelets app. It is a fun tool that is a great way for young children to engage in creativity using sensors without the full hassle of soldering and computer boards. Playing with Cubelets would be a wonderful way to introduce students to those concepts down the line. 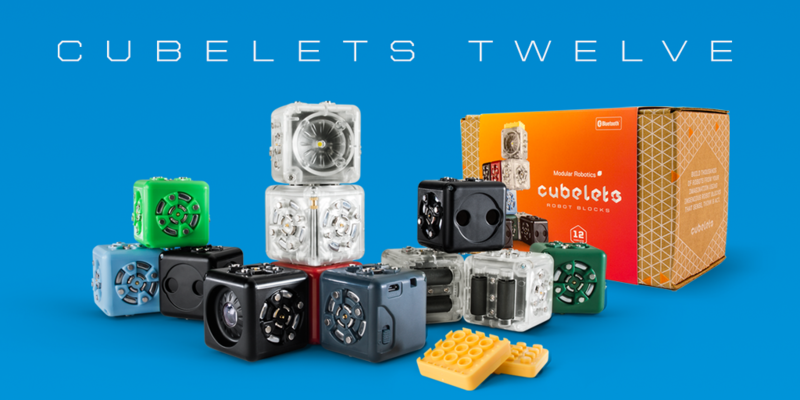 Cubelets has a great site for resources to show how Cubelets can be used in the K12 environment. Their lesson plans are a great way to engage students with Cubelets. If you want to dive in to the coding world, Cubelets has a couple of programming options worth checking out on their site. Using Blockly and Flash, you can program your own blocks to do exactly what you want them to do. Overall, I think Cubelets is a diverse tool that can be used for many different age groups and are worth exploring if you are looking for something new for your classroom or Makerspace. Cubelets was nice enough to offer a Promo Code for the readers. Add the Brick Adapters to your cart along with any purchase over $30 and apply the code at checkout to get the Brick Adapters for free. Cubelets did send me a kit for the purpose of the review, but that doesn't make the product less awesome. I'm always thinking about questions. Not just the questions I get throughout the day, but the questions I ask students and my own son. "What did you do today?" This is the most common questions I ask my son, but I know it is the wrong questions. I need to make sure I ask, "What did you learn today?" This question leaves open so many possibilities for him. He could talk about so many different things. Asking him what he did will limit him to actions performed, not ideas created. This is the same idea I'm trying to bring into the Knight's Forge Makerspace at University Liggett School. Is the correct question, "What do you want to make?" or is it "What do you want to learn?" I ask students what they want to make, but I feel like I have it backwards. I should ask them what they want to learn and then help them find the tools that best support their goal. The realization struck my yesterday when a student came in and he said he wanted to learn how to make music using code. He was focused on learning to do something, not just accomplishing something. I think that is a very important difference that people, me included, sometimes miss when want want students to create. Is it just the act of creation that we want, or is it the act of learning. If it is learning, shouldn't we frame makerspace better if that is not the message out there. I don't have the answer to these questions, but they are questions that are bouncing around my brain and I thought I would share them here for all of you to think about and hopefully share your thoughts. One of my favorite parts of managing a Makerspace is the freedom it gives me to allow students to explore areas that interest them. I have no idea what might spark a creative fire in them, but I like to leave lots of things out so students can find things on their own. A perfect example of that is the GoPiGo3 from Dexter Industries. I had the kit in my room for a week or so when a student asked what it was. I told them it is a cool Raspberry Pi powered robot that you can control through coding on your computer through a wifi connection. For a novice student, that might have sounded like gibberish, but this young lady had already earned multiple badges programing the Raspberry Pi. She was strong using Python and had used block coding in previous years. She asked if she could spend her study hall time building it. I was happy to let her dive in. It is always fun to watch a student explore something brand new. You can watch them encounter problems and find ways to solve those issues. You can watch their frustration turn into joy as they complete one step after the other. There were very few times that she needed my help to move her along. I was very impressed by her grit as a 6th grader having never built a robot before. During the course of the build, I had an opportunity to meet her parents and they wanted to let me know that she is talking nonstop about the build. Every day she had gone home and filled them in on the steps she has taken to build the robot and she can't wait to drive it. As a teacher, it always warms your heart to hear a student talk so passionately about something to their family. That is always a huge win. When I sat back and watched her drive the GoPiGo3, all I could think about was that this was because she wanted to do it. This was not a class assignment, this wasn't extra credit to bring a grade up, this was a student who was interested in something, dedicated the time to learn and explore, and then created something meaningful to them that they wanted to share with her family. This is what we want to see from our students and I'm glad the Makerspace is the spot where she could do that. Sometimes teachers can get caught up in the need to cover the curriculum that they forget that taking some time to find out what interested them can make a huge impact on their learning over the course of the entire year. I know I have been guilty of that in the classroom. That is why reflection time for teachers AND for students is important. Find out what is meaningful to students and see if that can be incorporated into the classroom. I'm very lucky to teach at a school that is supportive of student driven learning and the teachers here really afford their students the time to explore areas of their content area that interest them. It is a wonderful learning environment and I think the Makerspace adds that extra element that covers the things that classes do not. This is why I think Makerspaces are so important to the educational system. The young girl is excited to keep coding the GoPiGo3 and see what she can do with the distance sensor. I might have a future engineer in my space on a regular basis and her love this area might have started from just pointing to the GoPiGo3 box and saying, "What's that?" Thanks to Dexter Industries for sending me the kit. The student loves it and I think I will be creating a special badge just for her to show off the hard work she has put in for the project. Check out the GoPiGo3 here and see how it might be a nice addition to your Makerspace.